Batman: Arkham Origins is the third game in a series that's so far given us Arkham Asylum in 2009 and Arkham City in 2011. And yet, though this is our third outing as Batman and though Batman's origin story is perhaps the best known of any superhero ever, Origins means to tell you yet again the woeful tale of a happy family, a warm theater, a cold winter's night, and a fateful mugging-turned-murder that inspired a billionaire to don a mask and hit people in the face. Arkham Origins is a prequel that's also a sequel, and like all the weak entries in that category it suffers from a whole host of problems. The game suffers from the same paradox that plagued Star Wars Episodes I through III. You need to make a game that ostensibly takes place before the games people actually like, but without making it play worse. The result? Batman is already Batman. He has the Batcave, the suit, muscle mass that looks like someone painstakingly stuffed watermelons underneath the suit, and a whole list of people waiting to kill him. You also give Batman every single tool he painstakingly acquired over the course of Arkham Asylum and Arkham City, except now they're a little cruder. 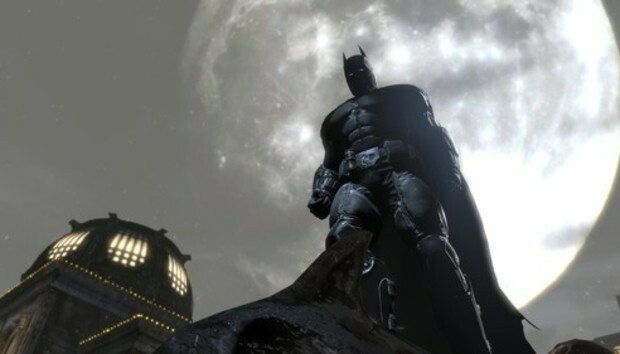 Nevermind the fact that Batman treated those discoveries in the previous games like legitimate advances in his arsenal. No, apparently he already had them three (Five? Ten?) years earlier. I promise. The game told me. Remember that part in Arkham City when you got Mr. Freeze's doohickey that let you make floating rafts out of ice and plug up steam vents? Now you have a glue grenade! And you make floating rafts out of glue and plug up steam vents with glue! But then at some point between Origins and City you lose the glue grenades, so I guess that freeze gun is actually pretty handy. Perhaps we can blame it on Batman's maid. Maybe she was cleaning and found his stash of ultra-useful crime-fighting tools and thought they were a pile of trash. "Where are my crime-fighting gadgets?" Master Wayne asked a few days later, but she just shrugged. Master Wayne didn't pay her enough to care. It's this same tedium, this familiarity, that permeates the entire game. Gotham City looks just as run-down and decrepit as it did in Arkham City. This is surprising. I wouldn't expect Gotham to look great at the best of times, but in Arkham City the area was literally turned into a gigantic prison to house psychopaths. You're telling me the psychopath-chic of Arkham City was actually just how Gotham looked? How could people even live there? The answer, as far as Arkham Origins is concerned, is that nobody did live there. Ever, apparently. Remember how amazing it was in Spiderman 2 when you could drop down to the street for the first time and there were just New Yorkers walking around? Gotham is empty. Or, at least, empty of anyone not wearing either a SWAT uniform or something picked up from the hip, local Crime Clothing Essentials boutique. Who, exactly, is Batman protecting in this city of ghosts? The streets are empty. There are Christmas decorations all around, but not a soul in sight who would appreciate them. Not even someone to get mugged. Just criminals apparently mugging other criminals. And then there are the villains. Here, we really get into the Sisyphusian tragedy that is every single superhero, but Batman in particular. It's a theme Arkham Origins hammers home at every available moment: Batman's such a good guy. Batman doesn't kill people. He puts them in jail! What a hero. It would be an absolute tragedy to take the life of even one villain. Life is sacred! You have to wonder if this is what Bruce Wayne tells himself at night, afraid to admit that he loves fighting crime. He doesn't want to kill any villains because then his steady stream of implausible crimes would dry up and he'd be out of a job. It can't actually be because Wayne believes life is sacred, given that every time one of these psychopaths escapes they go on to murder half the population of Gotham City. Batman is indirectly responsible for loss of life on an unfathomable scale. Arkham Origins trots out the same familiar faces in the same familiar scenarios. Bane wants to hurt you again. Penguin is still running some sort of black market. Even the side-villains are pathetic knock-offs of villains we've seen in previous Arkham games. At one point you'll fight Copperhead. She makes dozens of illusory copies of herself, and you fight them all at once. It's like that fight against Ra's al Ghul in Arkham City, except less impressive. Or there's the point where the Mad Hatter takes you into a surrealist world modeled after Wonderland...again. Just like in Arkham City. Oh, and Mad Hatter's levels are themselves shoddy knock-offs of the phenomenal Scarecrow levels in Arkham Asylum. Any villains you haven't seen before are merely filler villains. You know--the ones some underpaid, overstressed writer came up with at three in the morning with a deadline looming. "No, we can't just use Two-Face again. There has to be someone else." "Someone else" ends up being a largely forgettable crowd of bottom-roster hacks who will only spark a brief flame of recognition in the most diehard of diehards, so Batman is doomed in large part to fight the same old, same old again. I'd bet a hundred dollars you already know who the main villain of Arkham Origins is; I don't even have to say it. You just know, instinctively. Arkham Origins is completely predictable. The same characters, the same city, the same basic plot, the same combat, the same gadgets, the same puzzles. What once was so revolutionary in Arkham Asylum now seems staid--the game is a bit buggier, the combat a bit less smooth, the story just slightly more bumbling and blah. I don't think Warner Brothers Games Montreal made a bad game here. Arkham Origins is not a bad game. Arkham Origins is, in fact, exactly what the most cynical amongst games journalists thought it would be: a stopgap title to keep the Arkham brand going while Rocksteady is off working on something grander. It is Sisyphus pushing that rock up the hill for one more go-round. It's a perfectly middling game that couldn't possibly live up to people's demands from a title in the franchise, pushed out because it satisfies the formula and people will buy it. There's probably some complex math problem we could do to figure out whether you'll enjoy Arkham Origins or not. Something about time spent playing the last two games divided by time spent reading Batman comics as a kid multiplied by the number of times you've seen The Dark Knight, then subtract five if you think Batman & Robin is actually the best Batman film. Oh, and don't forget to graph the result along a curve with a slope that correlates to how many times you've unironically enjoyed Seal's Kiss from a Rose. Or you can just decide whether you want more Arkham Asylum/City, because that's what you're getting.